One evening a year ago, I picked up my daughter Zoe from daycare, and noticed that all of her friends had the same problem that she had – getting into the back seat of their parent’s car, truck, or SUV. There is nothing for our little ones to hold onto when they are getting into their car/booster seats. 1) Go to your local hardware store and get 30 feet of free rope. 2) Cut your rope into ten, three foot sections. 3) Grab three sections of rope and braid them together. Repeat two more times for a total of three braided ropes. 4) Then, braid the three braids of ropes together to make one larger rope. 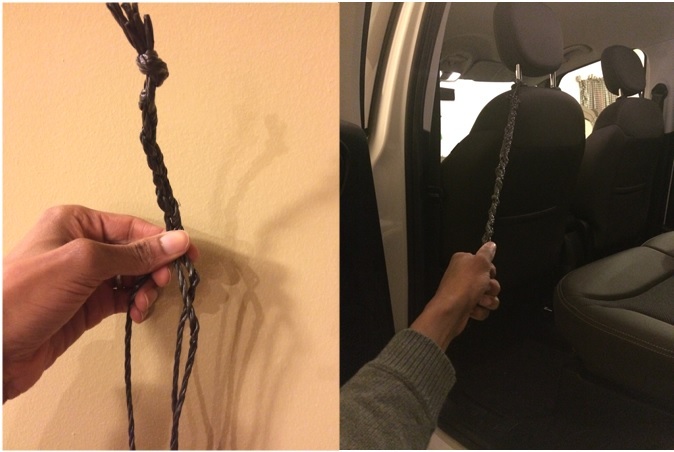 5) Take the last piece of rope and tie it in a loop to connect your Zoe handle to your front seat’s headrest.